Technically, I have 4 recent packages I want to post in thanks for the mailing. I have three of them scanned and ready to post. The final one needs to be scanned, it being yet another bombing from Wes. Maybe not a bombing, but a decent sized hand grenading. Just one point, Wes. Toss again. But when I look at the three packages that are ready to go, I realized they span the US, from coast to coast with a stop near the middle. So this post is a little more image heavy than I tend to write, but I hope you allow me to display a lot of pictures. Maybe I'll give you a bonus at the end. We'll start in the Eastern time zone with a package from the Night Owl. Vintage is a staple in Greg's mailings. Miscut vintage is even cooler. 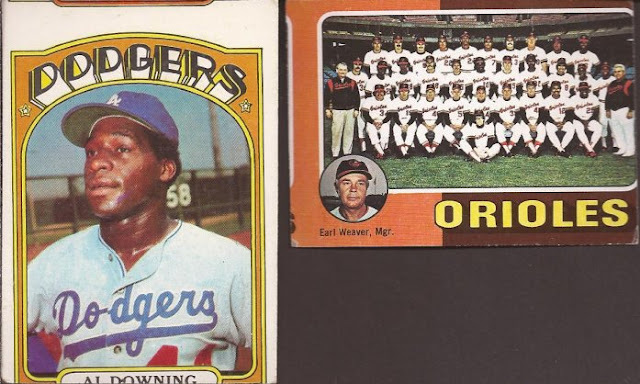 I appreciate Greg sending over cards that fit in his collection (these being his Dodgers and his '75 mini set), but are not needed and make great additions to my miscut binder. Earl Weaver is going to kill the cameraman in his portrait on the mini. I like goooooooooooooooooold. Two from last year's SC. 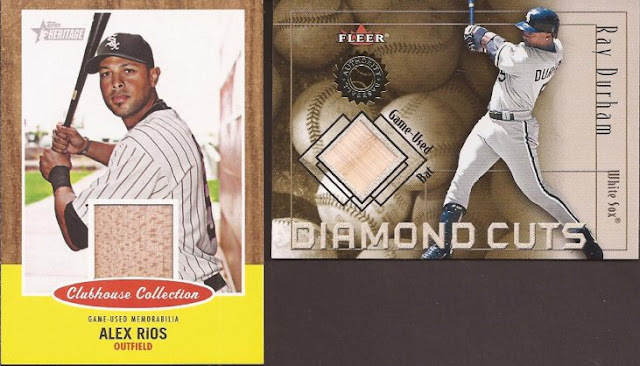 Gold parallels, so into the Sox box they go. I have no idea what vendor has such cheap vintage for Greg to purchase from, unless he is spending way too much on me. 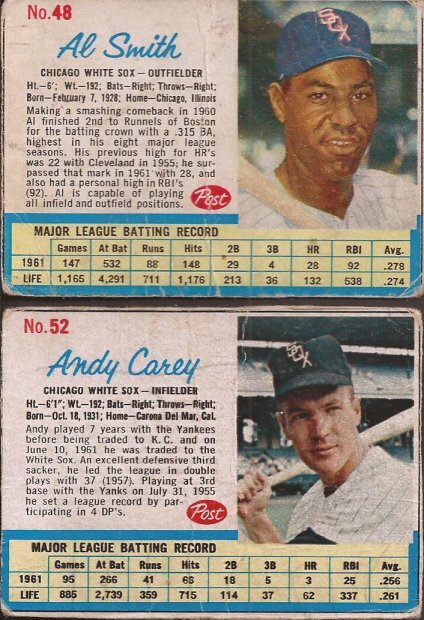 I cannot find a Pollet (or any other pre 70) White Sox card under a few bucks unless I luck out on ebay. Love the hack job on the Smith. I had to clean it up to get it into a binder page. And a Bazooka Chet Lemon comic. Yet another item I didn't know was a thing. I should have kept track of all the things I didn't know about that you readers have sent to me. Well into the hundreds I bet. Thanks for the cards. Greg. Let's jump on the US Highway system and take parts of I-90, I-80 and others to end up in Peoria, the home of P-Town Tom of Waiting 'Til Next Year. 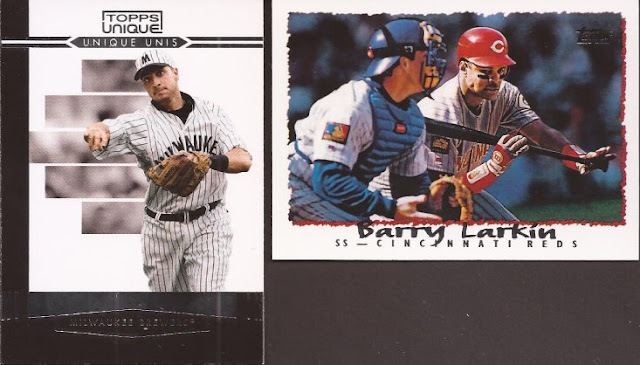 Tom sent a couple team bags of cards which helped with some late 90's teams sets, as well as more Bazooka. Again - new to me. I really was living in a vacuum or under a rock for years. Throwbacks and bunting. I love that set from the Topps Unique, but it must be a short printed set. I can never find any cards from it at a decent price point. I was glad to get this one. I believe that's two down from the set. That Larkin is not the original, nor the Berger's Best from this year but a Topps 60 card from 2010. Which means I need the one from this year for the bunting binder. And the original. And more Post too. I believe Greg and Tom coordinated their packages. 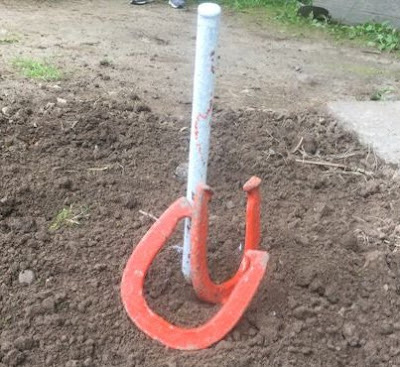 Well loved Post. BTW - I had Post Honey Combs cereal for breakfast this morning. Just a little peak into my life. Tom didn't coordinate the relics with Night Owl, though. Two sweet bat relics. Rios never did fill in when Dye left. Ray was a nice solid second bagger for us who didn't get the recognition in the league I think he deserved. His bat wasn't much but he had solid leather skills. Appreciate the cards, Tom. Continue west on I-80 for over a day and you finally arrive at the Pacific in the little town of San Jose, home of Fuji. Fuji and I pretty much just drop cards on each other from time to time. With all the teams he supports, there is always a relic or an auto I pull that will fit his collection. 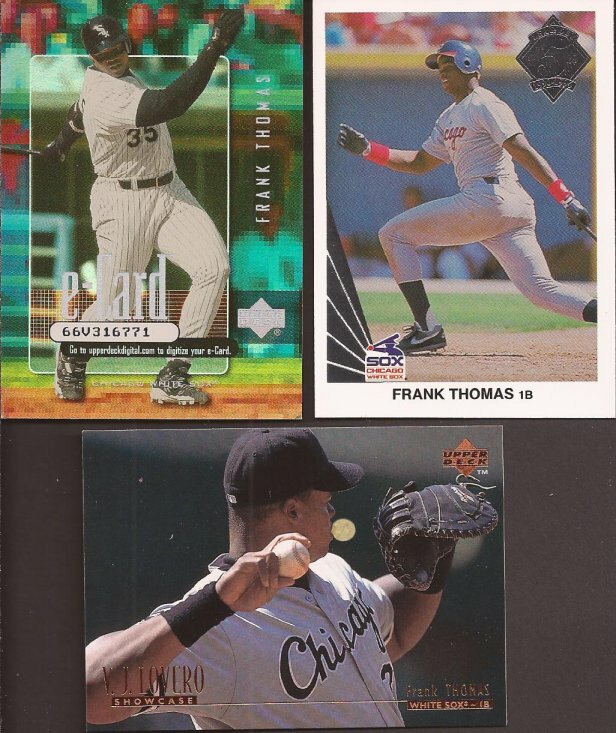 And in return, Fuji loads me up on Hawks and Sox, like the sweet cards of Big Hurt above. 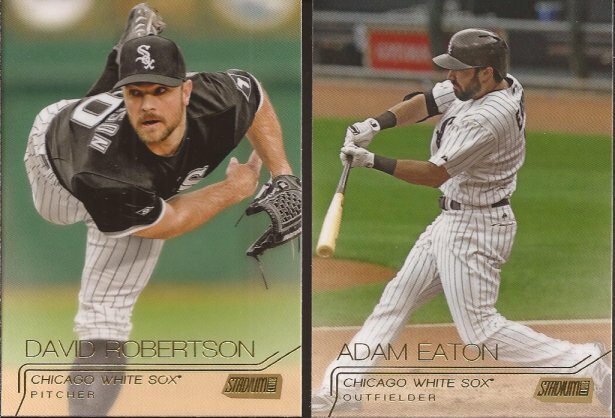 That is the first e-card of any White Sox player in my collection. I have pulled a couple from repacks, but never of my hometown boys. Man - did it scan AWESOMELY! Very 2014 Topps Finest. And while VJ Lovero photos are nice, they aren't in the same league as Walter Iooss. Two for the Paulie binder. How many more frigging colors are in the Bowman Platinum? Years ago, I would have called the Baseball Greats set in the middle horrid, but either I am getting more mellow with age (no way) or its simplicity is really striking a chord. Either way, I was glad for the few of these Fuji added. I would call these all busted Hawks, but I can't. Cleary left to win a couple Cups with the Dead Wings. Zhamnov came over from Phoenix when we traded Roenick and did pretty well in the Indian head sweater, even wearing the captain's C a couple years. Daze was a career cut short. 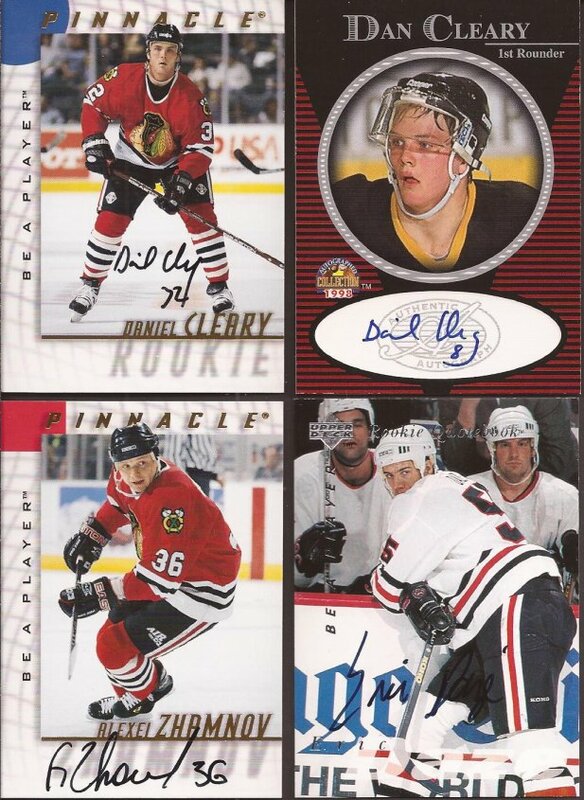 He should have had many more quality years with the Hawks, but injuries shortened his time in the Madhouse on Madison. Normally, an auto or relic ends the mailing images, but there was one huge stack that Fuji sent over. I'm guessing these came from a flea market find and Fuji dropped two unopened packs along with about 40 other sheets of these Topps rub offs. 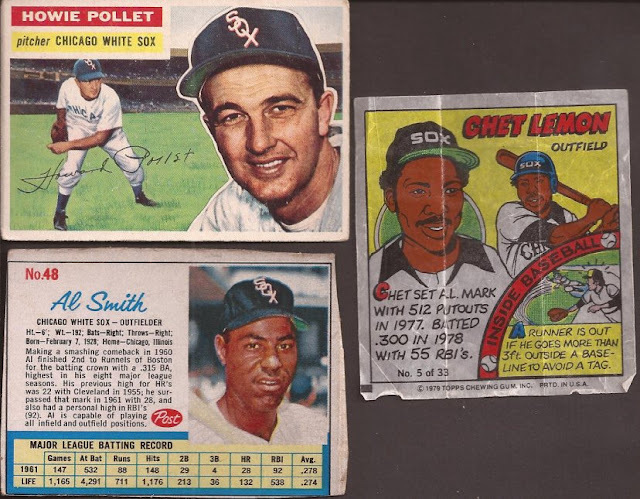 Here's the White Sox I found among the sheets - Fisk, Baines, Hoyt and Kittle. I believe I have just the Baines in my Sox box. 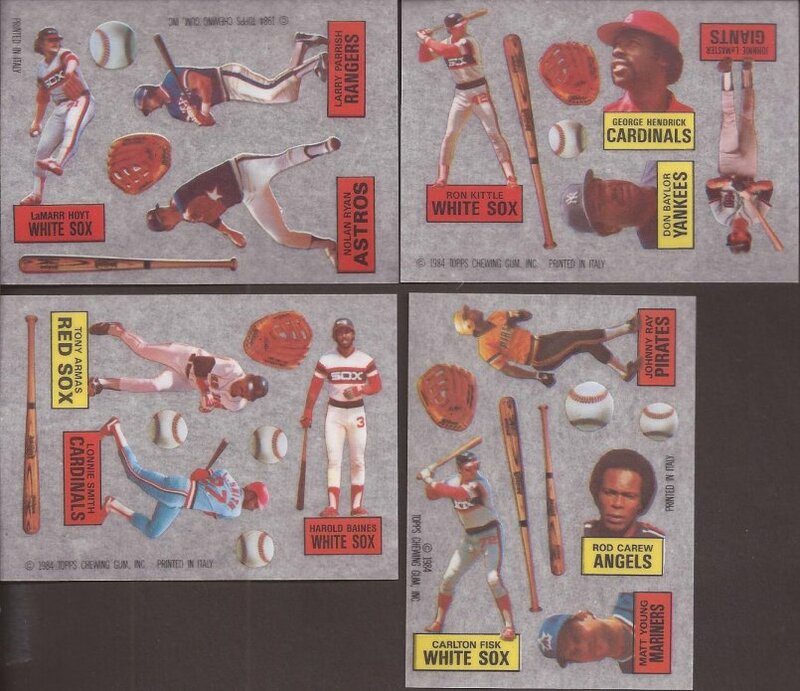 Hoyt shocked me as an addition to the set, until I realized these are from 1984 and Hoyt nabbed the Cy Young in 1983. Fuji, thanks for the cards. Ok - back on I-80 to Castle 2x3. And no, I'm not stopping. If you have to go you should have went before we left! You can't claim Kate as a bonus if you don't put her on my car! I bet Wes has topped those leaners with a ringer.